Congratulations to Royal Enfield on winning the prestigious Indian Motorcycle of the Year award 2014. ‘IMOTY’ is the most credible and coveted automotive award in the country. This award is an expert and independent judgement on the best new motorcycle. It is aimed at recognizing focused, consistent and rigorous efforts made by motorcycle manufacturers, with the highest levels of performance in the areas of design excellence, innovation and R&D. 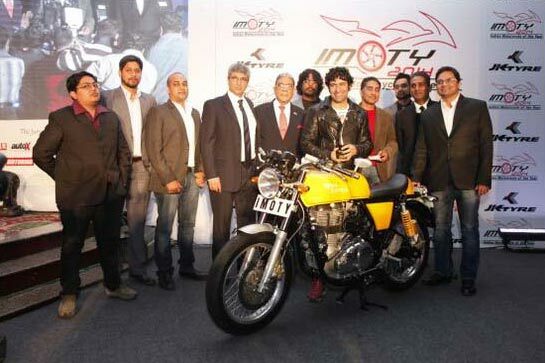 The top three motorcycles for the IMOTY included the Royal Enfield Continental GT, KTM 390 Duke and Hyosung Aquila Pro. The nominated motorcycles were judged on various parameters such as price, fuel efficiency, styling, comfort, safety, performance, practicality, technical innovation, value for money and suitability for Indian driving conditions.